Bryan Habana will end his career as the second highest try scorer in international rugby behind Daisuke Ohata of Japan. South Africa's record try-scorer Bryan Habana will retire at the end of the season. The 34-year-old, who scored 67 tries in 124 Tests, was part of the Springboks side that won the 2007 Rugby World Cup. "The inevitable moment has come knocking on my door and I've welcomed it in for a drink," the Toulon winger wrote on Instagram. Habana, who made his international debut against England at Twickenham in 2004, scored eight tries to help South Africa reach the final of the 2007 World Cup where they beat England. In 2015, he went on to equal former New Zealand winger Jonah Lomu's record of 15 tries in World Cups. 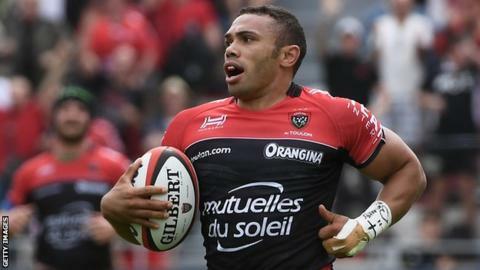 More recently though, the winger has been beset by a knee injury and the form of fellow wingers Chris Ashton and Josua Tuisova has limited his playing time at the French Top 14 side. Habana last played international rugby in 2016, and ends his career four appearances short of the all-time South Africa appearance record set by Victor Matfield.